I'erlman Campus at 6501 W.
the Jan. 4 thru Jan. 6 weekend. building at 2H)!> NW Mrd Ave..
Jan. <>. on the grounds. show it cares and shares. statehood in the world of nations. mitment. See storie Pages 12 and 13. Then last week Maj. Gen.
appointment of Rabbi Albert B.
author and chairman of the U .S. more we want to know it. We are still in danger. 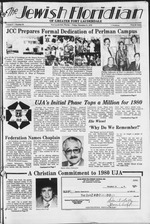 A Christian Commitment to 1980 UJA"
come), and some "bright side"
OOOO NEWS FELLOWSHIP CHURCH. INC.
fought for 21 centuries ago. at Lauderhill City Hall on Dec.
will we succumb to it in Iran. FREE OF FEDERAIINCOME TAX . Q Pleas* tend your brochure on tax-free municipal bonds. the State of Israel is threatened. not racist, and it is not a crime." Five chapels serving the New York Metropolitan Area. Memorial Chapel. Inc /Funeral Directors. For generations a symbol of Jewish tradition. Story, and Israeli Life styles. from that in the United States. 1799 West Oakland Park Blvd. some truths that will be unaffected by the outcome of the crisis. understanding of the fanatic elements of Islam. Our allies are not willing to stick their necks out for us. evokes feelings of, "Now there's a friend in our time of crisis." option. Both offers have been taken less than seriously. Member at the Jewish Telegraphic Agency, Seven Arts Feature Syndicate. something that we have been saying all along. It is not a question of downgrading the accord. It is rather a question of handling it with caution. Sinai region that has iust been returned to Egypt. dividual's normal Israel Bond purchases. helping to achieve that end. not yet accepted the post. early stages of the peace process. for decades more than that. public opinion on foreign policy. say "there ought to be a law." davits from relatives in Israel. wait 18 months for an answer. reason for refusal of an exit visa. first official event in the Hall. 5,000 per month in 1979.
economic advantages in the U.S.
these highly Visible waiting lines. same. Like mayonnaise and salad dressing. what we call a miracle. the Sheffield Convalarium holiday party celebrating Hanukah and Christmas. drop off their discarded glasses at the JCC. Broward Comity. The new minimum is $25. maintaining accurate mailing addresses have all risen dramatically. rates among English-language Jewish newspapers. chandise," at 4328 N. State Rd. sale at the thrift shop. of the situation in Teheran." Nablus and reinstate him as mayor. chief spokesman, Hodding Carter, said the U.S.
decision, Carter declined to go beyond his statement. VtateA & 0m <*~Up ,9'fiec^L . compared to 49 the previous year. that he can join her in Israel. reception hosted by U.S. Rep.
chusetts, and 11 in Arizona. 1979 R. J. Reynold* Tobacco Co.
paid members of the lodge. treaty between the two nations. At a separate ceremony, Dr.
year, it was reported here. in Detroit in the near future." under wide attack at the time. course of my investigation, Mr.
from several Board members, Mr.
part of the peace with Egypt. longer limited to tree planting,"
to the National Security Council. None of the calls was returned. he received the text of Rep.
followed by sessions Jan. 22, Jan.
and Jane and Ron Schagrin. Dedicatory Tablets, Original Sculpture, Etc. Send for free calalog or call. of interest for the whole family. camp dates are June 23 to Aug.
and in March a magic show. establishment, JCC at 6501 W.
SHOP ALL JM STORES SUNDAY. 11 A.M. TO 7 P.M DAILY, 10 A.M. TO 10 P.M.
1978 UJA campaign in Omega. United Way fund raising drive. CPU for the American Red Cross. extensive tours of the country. to fight for the Begin plan. per cent earlier this year. it was announced this month. to her family and guests. Jeanne Daman and Henry E.
made at this time "inspire the entire Inverrary campaign." troopers when they invaded Belgium. small synagogue in Brussels: "Aren't we all brothers? Don't we all have the same father?" the words 'Lo La'tor, Lo La'tzor' (don't stop, don't stop). keep going because it is still a war for survival." KING KOLD always gives you more. for a FREE package of the item you selected. on a package of Blintzes/Crepes. J KingKold Frozen Foods. Inc..; 70 South Water Market. who call them brother. The U.S.
privilege of being a LION." have so many of you here today. wonderful to see the response. .
Jews. We stand as one." "A Train Goes to Russia,"
Chairman will be Dave Brown. AvaHaM to urtom (or any occaHon. I On The Ocoaa INI CoNm\km. formance with a plea for Israel. cruel enemies again and again. solidarity with Jews in Israel. commitment to U J A." are one with them in Israel." ork City several days ago. alcoholism "is not going up, and. a Jewish cultural "life script,"
death and hardship for Jews. admit that they are alcoholics. that he / she abuses alcohol. myth that Jews do not drink." year after year. Smart Jewish homemakersV. A living tradition in Jewish homes for more than half a century. Friedman, were invited by Rep. IN THE evening, State Sen.
as Committee of Concern leaders. of Southern Bell Telephone Co.
$100,000,000 for our hundredth birthday in 1986.
our century birthday. Tell us that you're with us. Tell us: irO "Itr^ "more power to you!" standards. What shall we do, Ed? fix the price at today's levels. has become practically the norm. of this land to fruitful abundance. they no longer need our help. the beginning of this fiscal year. qualify alas! only too well. into the Youth Aliyah programs. us CASH And we need cash. percent over prime or 15 percent. Inflation runs in excess o( 10 percent a year. than 25 percent each year. redemption of our pledges, this is a promise unkepta trust betrayed. Cash is Needed Now. More Than Ever. the aid we give them, or both. Solomon. Ed. Help us not to. sure palace in the Western Heimsphere. and the Oasis await your dining tastes. featured twice nightly except Monday. life on Grand Bahama Island. Ice to two roundtrips a week. Savings and Loan Assn. .
i/oo w. Oakland Park Blvd. ____ at one of the world's finest resorts. request it when you make your reservations. Happy Hanukkah! from 10 a.m. 6 p.m.
invited to visit at no charge. Gardens Rec. Hall -11:30 a.m.
Park 29th Street 8:30 p.m.
Jean Kozin at the piano 7:30 p.m.
Fields" 4 p.m. and 7 p.m.
DRS. BRATTER & GOLDBERGER, PA.
city is to leave it in Israeli hands. >-*jority in that golden city. yearning in all of history's scope. veyed his regards to him. Black priorities are now changed. at home and the other abroad. to blowing the road up. For us all. 4850 w Oakland Park Blvd. occupy her time. Now Mrs.
in nursing homes ana nospitals. have grown over the years. provide a high calibre of ex-,. 10 lo 5:30 Mon thru SaL 11 to 5 Sun. (o you wul yocM fanuiy: . songs and the Shabbat service. be held on the Gait Ocean Mile. guests are invited to attend. and meet Rabbi Jeffery L.
principal of the Hebrew School. vah of Lee Feinberg, son of Mr.
Mr. and Mrs. Edward Nelson. Mr. and Mrs. Edward Garrett. sponsored by Mr. and Mrs.
vah of Marc Poris, son of Mr.
Mr and Mrs. Rudolph Cotler. Laura Winnik, daughter of Mr.
participate in the Torah service. England will conduct the 10 a.m.
2. April 1979. 300 Christians. / iV P lsraeli war widows. for the 6-month period beginning Jan. 1. At 10:30 a.m., Saturday, Dec.
the Oneg Shabbat of Friday, Dec.
Richard Smith, son of Dr.
4351 West Oakland Park Boulevard. BETH ISRAEL TEMPLE. 7100 W.
servative. Rabbi Albert N. Troy. Rd. Orthodox. Rabbi Moshe Bomzer. 7*73 NW 4th St. Hank Pin, president. TEMPLE SHOLOM. 132 SE 11th Ave.
NW 9th St. Conservative. Rabbi Dr.
Solomon Geld. Cantor Max Gallub. Drive. Retorm. Rabbi Leonard Zoll. David Berent. Cantor Joseph Pollack. Beach, on Sunday, Dec. 23. Jeanne, will take place at 1 p.m.
word; $50, and a sentence $250. ever we MUST be one." our youth and our families at home. is a gift of light and life.